Around 20 sister newspapers ran the same front page wraparound to launch a new charity campaign. Johnston Press titles in Yorkshire all printed the wrap yesterday to highlight the bid to raise £1m for a new cancer care centre for the county. A new £6m Maggie’s Centre, which offer free practical, emotional and social support to people with cancer across the country, is currently being built in Leeds. £5m of the £6m required has so far been raised, and JP is calling on readers to help get the project over the line. In a piece announcing the campaign’s launch, Yorkshire Post editor and JP Yorkshire editorial director James Mitchinson wrote: “I recently lost my father-in-law to cancer; I lost my grandad to cancer; I’ve lost friends to the disease and seen others’ lives changed forever having beaten it. “Statistics suggest I will lose someone else close to me to cancer, and may ultimately face my own battle with it. 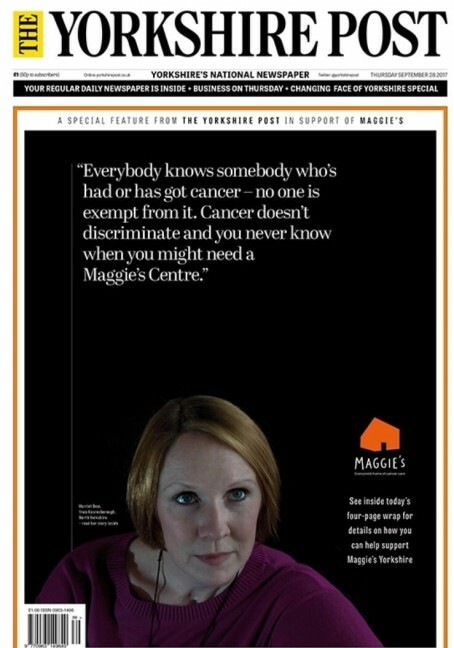 My experience with the so-called big C is not unique: every year 30,000 people across Yorkshire and The Humber sit down to be told they have cancer, and yet, our county is the biggest in the country not to be served by a Maggie’s. “Maggie’s centres offer specialist support, counselling and conversation to cancer patients and their friends and families to help them in their day-to-day battles with tearfulness, frustration, isolation, depression; in fact, every emotion that comes with hearing that dreaded diagnosis. The new facility is set to be built in grounds of Leeds’ St James’s University Hospital, but will service the whole of Yorkshire. James added: “To show our collective support, each one of Johnston Press’ Yorkshire titles will carry this wrap-around call-to-arms: from our flagship dailies the Yorkshire Post, The Star, Sheffield and Yorkshire Evening Post to our leading weeklies including the Scarborough News, Halifax Courier, Doncaster Free Press, Sheffield Telegraph, Wakefield Express and Harrogate Advertiser – and indeed every other title at our disposal. “Through our unrivalled community engagement with people we know care about this county – JP Yorkshire sells almost 400,000 newspapers per week – we genuinely believe that with your help, we could be looking ourselves in the mirror before Christmas knowing we have together helped people we don’t know, and very likely people we do know… and love.